So for today’s blog, I will share you one of the vitamins that is must-have to my shopping list. Aside from having taking good care of my skin, I am also very serious in taking care of my nails and hair. You see, I never colored my hair and seldom experienced hair treatment. 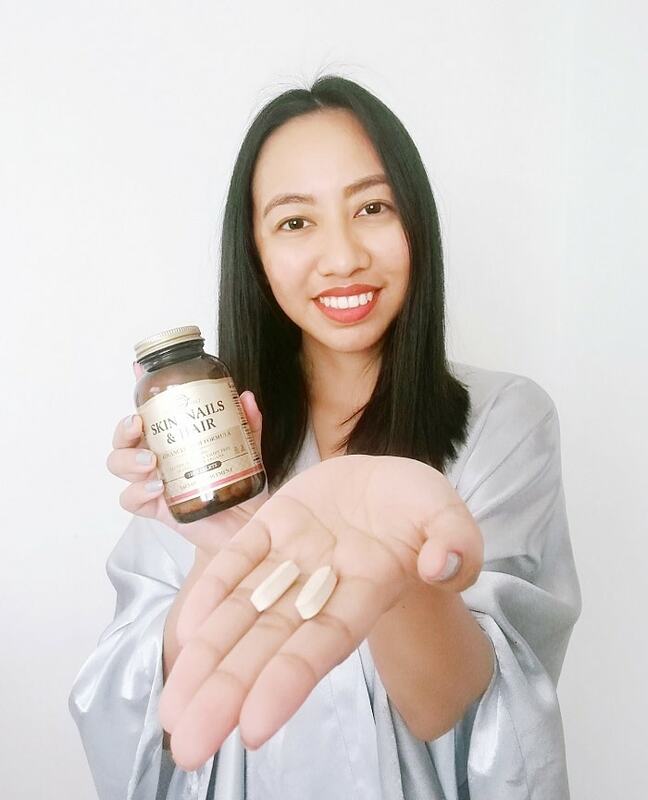 Aside from using some hair care products, I am also taking this vitamins that promises to have you a healthier and stronger hair and nails, and good skin. I discovered this Solgar vitamins about two years ago when I visited their shop called Healthy Options. I thought I should try it for a month and see if it works on me. And I am happy to say that it did! 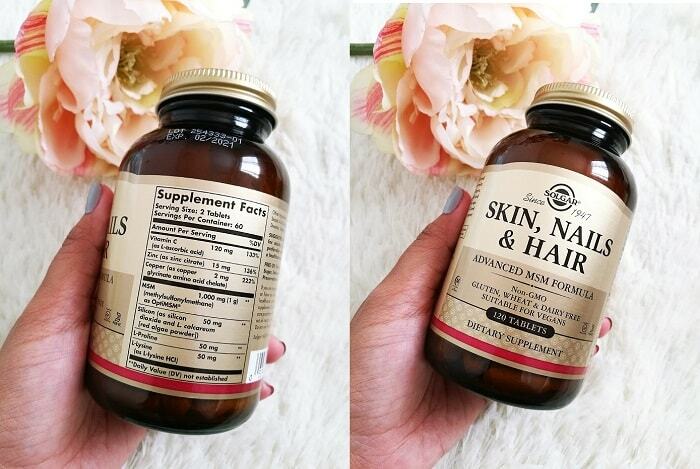 This vitamins supposed to help you achieve a healthier hair, nails and skin. It is also sugar and salt free so this is perfect for those into vegan lifestyle. I take 1 tablet everyday but some take 2 tablets a day. I only took 1 each day because the tablet is quite big! For two weeks, I’ve noticed that my hair grows stronger, I could see my hair strands becomes thicker which is good for me. My nails are not brittle anymore, and my tan complexion is glowing the way I like it. The cost? I bought this at Php1,450 per bottle with 120 tablets which isn’t bad at all. You can take 2x a day depends on your needs. 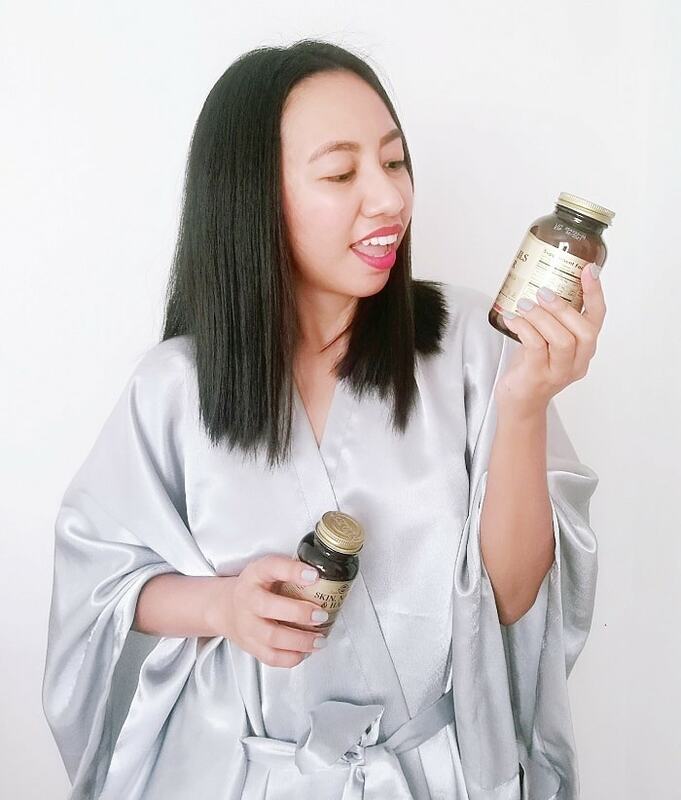 Taking this supplements, doesn’t after on my daily diet (actually I didn’t noticed any change or cravings of something) and I am glad it works that way. I’ve been taking this for two years now, and surely works on me and I recommend you to try this as well. But if you are pregnant, it is advisable that you seek your doctor’s advice about it. I am not sure if this is good for young kids, but it is best to consult your family doctor. My nails are so brittle (the colder weather doesn't help them) but I should try this formula to make them stronger! These are actually amaze supplements as i’ve tried them before too! Thanks for sharing! Oh wow, did it work on you?! 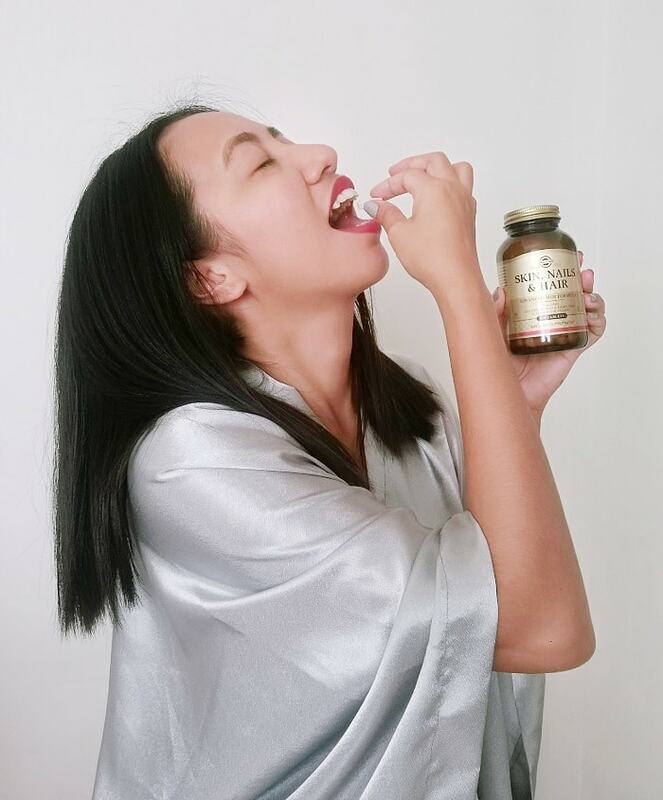 With your perfectly glossy hair and healthy skin , I am highly tempted to start using this hair and skin supplements but I will have to check if I can find them in India. Thanks Preeti! This product is made from USA, and hope it is available in India. Gladly our healthy shop here do the import. I need these in my life!!! I've just come off antibiotics for mild acne so hoping that my skin doesn't flare. I have a good diet and take other vitamins but a special skin, hair and nail supplement like this would be worth trying! You can try this. After years of taking this, no more hair brittleness, my nails are stronger and gives me better energy. Though sometimes its quite challenging on taking each capsule coz its big! I am convinced that supplements are often very useful besides creams, the whole action is important. That's true, taking care of ourselves inside and out! It sounds like an interesting product. I have been struggling with my nails for the past year or so, to the extent that I gave up nail polish for a while. I would be interested to try them and see if they can make my nails stronger. You can try grabbing its smaller bottle with 60caps! Oooh sounds awesome! I would love for my hair to be a little glossier, and my nails are ridiculous right now. May have to look into this! That's awesome. It helps to make your hair stronger too! Maybe Solgar will work on you, I think this isn't hard to find in your nearest drugstore. I am always on the look out for some hair and skin vitamins. This one falls right in line with it. I would love for my hair to get back to being strong and healthy like it was before I became a blonde. I will definitely look into their stuff! Thanks for sharing! Wow that would be great Andie! Hope this Solgar vitamins are available in your city. I really like that this is a vegan product! I have tried gummy version of vitamins and although they are good, they have a lot of sugar. This is a great option! Thanks for sharing your thoughts! Taking them for 2 years is a long time, so they must be great. Oh What brand of gummy version did you tried before? My wife used these after she gave birth to our daughter and she said they were fantastic!! I have never tried this type of supplement. I see my friend doing it. I generally prefer external source for hair. 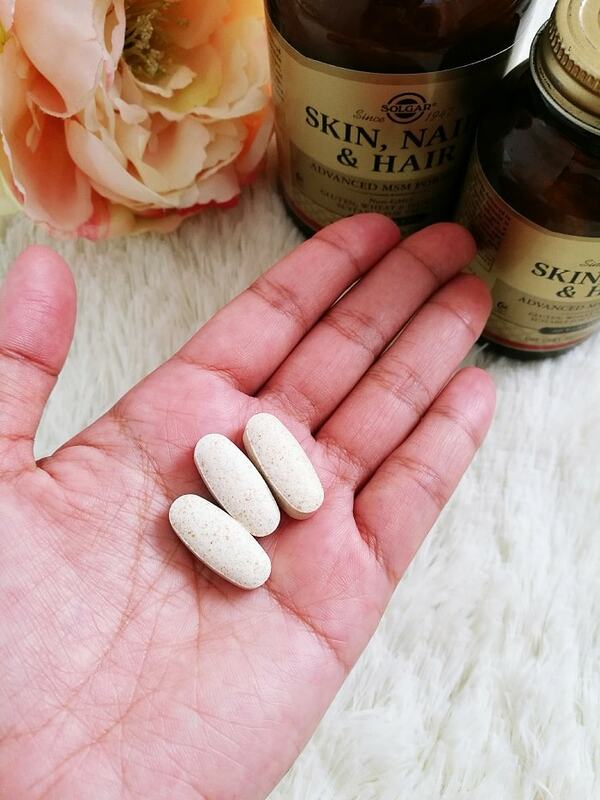 sometimes we need supplements because our hair are rooted from our cells internally. You have a great skin and hair. I shall definitely try it out. oh thank you Megha :D Oh eating healthy foods helps too. I know right! Its huge! I would absolutely need vitamins for my nails. I'm growing them and sometimes, they get so brittle and break. I'm a big fan of this brand! I've been purchased their supplements for a while. I just got some of their B12 vegan supplements. Wow that's great! How's the B12 supplements? I am thinking of getting that as well. The first thing I saw was the size of that pill! I have a hard tie swallowing pills so EEK! I am glad it works. I might try them but I would have to break them into smaller pieces! lol yeah, but it would be more harder to swallow if you break them into pieces. My hairs have become so thin and do not look good without using ironing or any styling product. It's really good to know about the essential vitamins. I will look for them at my nearest store. Thanks for sharing. Another tip is I don't go out with wet hair. I always make sure it is perfectly dry with my hair blower. My hair could really use some good nutrition. This winter really damaged it. My skin and nails have taken a beating too. I haven't experienced winter yet, but during rainy season (which is a bit cold here) by hair becomes dull. Good thing I have this supplements to keep my hair and nails healthy. I truly need to get on top of more vitamins. I'm sure my poor hair and skin would thank me! Your skin and hair is amazing! I dont know if its available here in India or not but will surely give it a try if I get these! I know my daughter would be curious. But I would feel badly having her take another pill she has to take enough already for allergies, asthma, migraines, stomach issues, and a few other things. I have to make this part of my supplementation. I take all my vitamins, but I still have terrible nails and dull hair. I can't wait to try this! You can try to buy their small bottle. What a great supplement for your hair, skin and nails. I really love you hair! Although I love how my wife's hair and skin looks, I bet she'd like to know more about his. I will share this with her. That would be fantastic! We ladies love to care for our hair. Yes you can try it, and also eat some foods that helps to make your hair healthier. I was taking a similar supplement for months and never saw a difference. Maybe it was the brand. Oh I see. Sometimes not all supplements works to everybody. I need this so badly! I need to take some supplements for my hair. This sounds like a perfect plan. Passing it on to my wife who would find the products useful. yes, ask your doctor first. I take the GNC hair, nails, and skin vitamins. Have you tried them? If so, do you think Solgar vitamins are better? I haven't tried GNC brand, maybe I should and see the comparison. First time I heard the brand. As a pharmacist, I really look into the efficacy and safety of any supplements or medications. Need to review this. I recommend to visit the doctor first, before purchasing this after all its a supplement. That sounds great to try! I would really like to try to get my hands on some of this. It looks like some pretty good stuff! I have a problem with weak nails. I'd love to give this a try to see if it can strengthen them up. Hope this nail supplements works on you. But visit your doctor first! I love the way your hair looks - so gorgeous and smooth. The Solgar Vitamins is definitely working. Thank you Erin! It also helps that my hair didn't undergo any coloring and other harmful treatments.